Parsons Marsh is part of the Undermountain Valley, a wetland and forest area in the heart of Lenox. Berkshire Natural Resources Council, the Town of Lenox, and private landowners have partnered to conserve this land for farmland soils, wildlife habitat, and recreation. 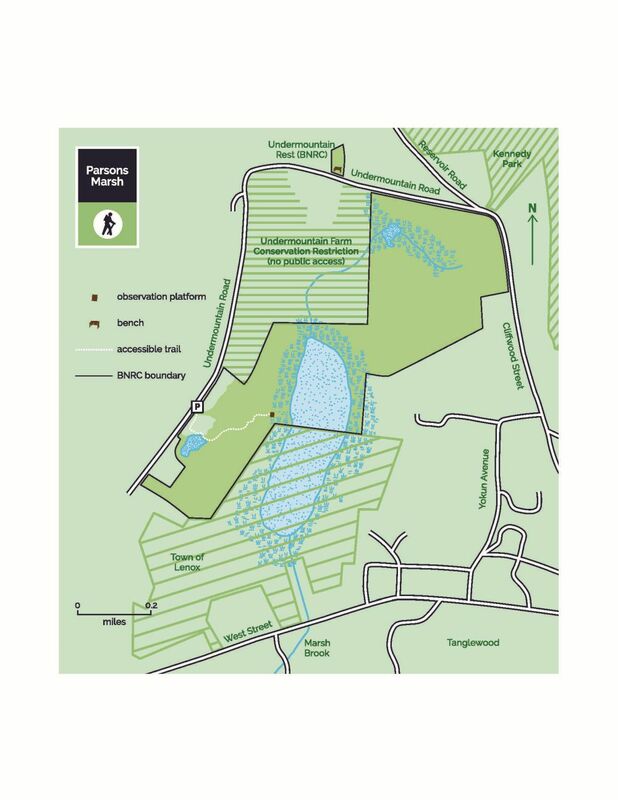 BNRC’s 183 acres now offer an accessible trail that is half hard-packed surface and half boardwalk, encouraging all visitors to enjoy the wetlands and woodlands, and observe the abundance of plants and animals. 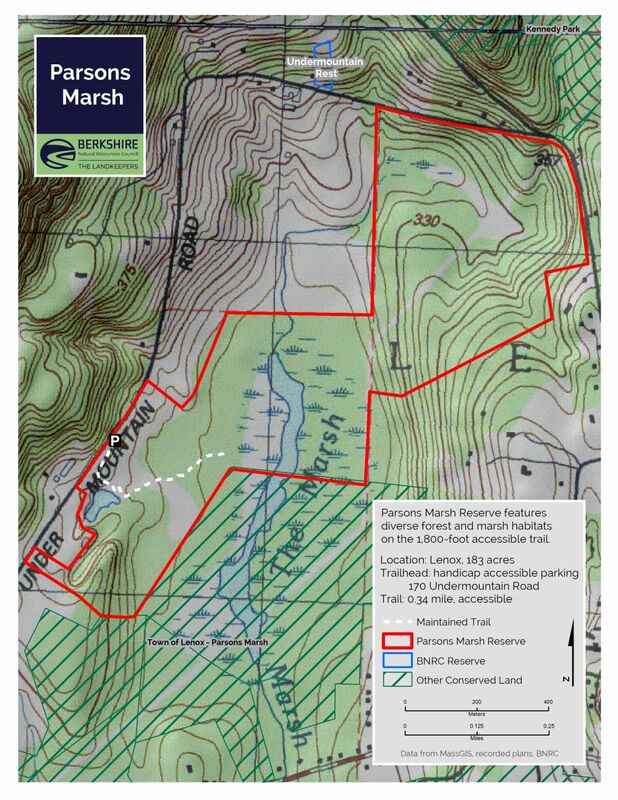 NOTE: this is the first Berkshire Natural Resource Council property that is NOT open to hunting or fishing. We made this decision because it is not possible to allow hunting on BNRC’s land while supporting the deed restrictions on the Town land, which preclude hunting and fishing. From Lenox: From the center of Lenox, head south on Main St. Turn right at the 1st cross street onto MA-183 S/West St and follow for 1.4 miles. Turn right onto Under Mountain Rd. The trailhead is 0.9 miles down the road on the right. The Parsons Marsh trail and boardwalk were designed and constructed by Peter S. Jensen & Associates, LLC. On the 1,800-foot (one-third mile) accessible trail, you will wind through an open meadow to a small pond, then into forested upland and vegetated wetland. It provides open views of this large marsh as well as opportunities to sit and experience each habitat. Rest on the bench or picnic on the accessible table near the pond. Just beyond the pond, the trail transitions to boardwalk as it enters the forested wetland. Take note of the large birch trees and their raised root systems covering the forest floor. The trail ends at an observation platform which provides open views from the edge of the marsh. Parsons Marsh takes its name from John E. Parsons, a New York City attorney who purchased land in 1875 on the west side of Under Mountain Road and built a Gilded Age house and outbuildings. The original house was razed but the barn still stands as part of Stonover Farm. After Parsons’ death, his daughter Mary Parsons donated a large parcel north of Reservoir Road to Mass Audubon, which became the heart of the Pleasant Valley Wildlife Sanctuary. Parsons’ daughter Elsie married John Drummond Kennedy who, after her death, in 1974 donated 84 acres at the southern end of the marsh to Lenox in her memory and in honor of her father. Kennedy also advocated having Lenox buy the land formerly owned by the Aspinwall Hotel after it had burned down. Lenox named the park created by this acquisition Kennedy Park in his honor. Starting in 2016, BNRC conserved 183 acres in the Undermountain Valley, buoyed by an outpouring of support. Today, BNRC’s Parsons Marsh Reserve and Trail is a natural gem, open and free for residents and visitors eager for an immersive experience in the outdoors. 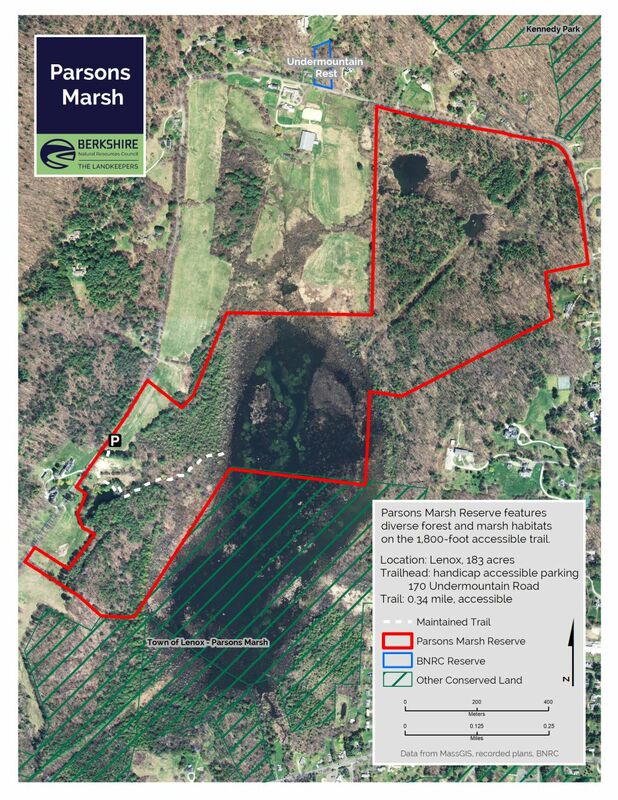 With the marsh conserved, we are looking for opportunities to build additional trails, including future connections to Kennedy Park and downtown Lenox. Beautiful rock outcrops to the south will be a compelling destination for an extended trail system. Admire pollinators in the meadow, look for amphibians by the pond, seek skunk cabbage in the wetland, and try to spot some of the 75 nesting bird species that have been identified in Parsons Marsh. This area is also home to white-tailed deer, eastern coyote, black bear, bobcat and both red and gray fox. The marsh and surrounding water bodies also house beaver, mink and otter. The forest in the southern part of the conserved area is dominated by white pine but also includes such hardwoods as red maple, sugar maple, white ash and black cherry. To the south you’ll find large rock outcrops, remnants from the glaciers of 20,000 years ago.